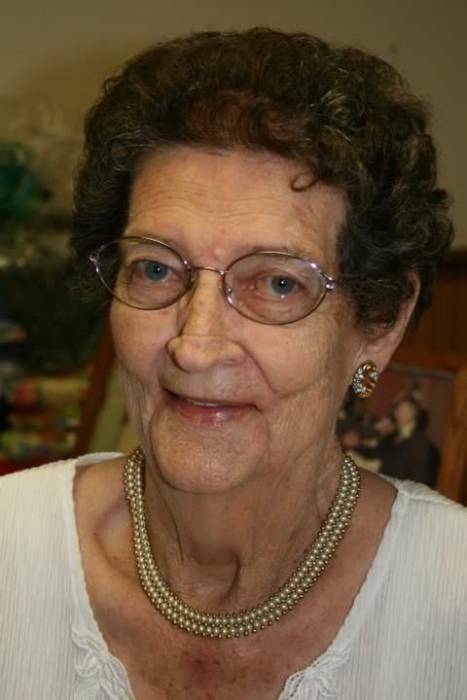 Lorene, nee Bouas, Sinn, 92, of Darmstadt, IL; born on January 6, 1927 in Coulterville, IL; passed away on April 14, 2019 at her home. Mrs. Sinn and her husband Leonard owned and operated Sinn’s Inn in Darmstadt for over 20 years. She attended Holy Ghost United Church of Christ. Lorene enjoyed embroidery, making quilts and word find books. And she loved listening to her children play music. She was preceded in death by her parents – Frank and Ethel, nee McCauley, Bouas. Her husband Leonard Sinn whom she married on May 1, 1943 in Coulterville, IL and who passed away on April 18, 1984. A son, Myron, in infancy. One grandson – Mark Sinn. Two sons-in-law – Roger Trentman; Charles Geralds. Brother and sister-in-law – Wilber (Agnes) Bouas. . Sister and brother-in-law – Nelda (Jim) Robb. Brother-in-law – Roland Eaton. Brother-in-law – Elmer Sinn. Sisters-in-law and brothers-in-law – Esther (Bill) Shubert; Aletha (Norman) Erb; Irene (Harpel) Triefenbach. She is survived by her children – Larry (Debbie) Sinn of Belleville, IL; Mary Trentman of St. Libory, IL; Shirley Geralds of Marissa, IL; Loren (Laurie) Sinn of Freeburg, IL; Dennis (Nicole) Sinn of Marissa, IL; Lennie (Kim) Sinn of Darmstadt, IL. Fourteen grandchildren – Tamara (Dave) Elbe; Alan (Nicole) Sinn; Monica (Pete) Palumbo; Rhonda (Brad) Schmitz; Casey Trentman; Stacy (Tommy) Tucker; Shelly (Fred) Meister; Daniel Geralds; Chris (Cheryl) Sinn; Adam Sinn; Courtney (John) Schwartzkopf; Savanah Sinn; Tyler Sinn; Trevor Sinn. Twenty-two great-grandchildren. Three great-great-grandchildren. Two sisters – Helen (Bob) Mulholland of Marissa, IL; Jean (Ron) Kuhnert of Pinckneyville, IL. One sister-in-law – Viola Sinn of New Athens, IL. Also survived by nieces and nephews. In lieu of flowers memorials may be made to Darmstadt Memorial Cemetery or Holy Ghost Women’s Guild. Visitation: Friends may call at Holy Ghost United Church of Christ in Darmstadt, IL on Friday, April 19, 2019 from 7:00 a.m. to 11:00 a.m.
Funeral: Services will be held at Holy Ghost United Church of Christ in Darmstadt, IL on Friday, April 19, 2019 at 11:00 a.m. with Rev. Nancy Shubert officiating. Interment: Burial will be held at Darmstadt Memorial Cemetery in Darmstadt, IL. I am very sorry for your loss! I wanted so bad to come to the visitation but my mother is staying with me through Easter weekend. I live two hours away and I can’t leave her alone that long. You are all in my prayers and I send my deepest condolences! !